36 MB|7 ppt shows + audio; 7 sheet copiable workbook; posters/flashcards; color pupil vocab mat; plans. 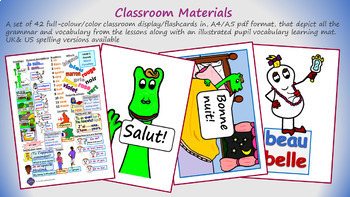 Seven elementary Grade 2+ (UK KS2) French lessons with a wealth of supporting materials. OBJECTIVES: 1. Introduce ourselves; 2. Describe ourselves; 3. Say how you are; 4. Say your favourite color/colour; 5. Say your age up to 12; 6. Asking questions 7. Give personal information. 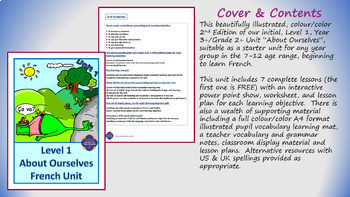 CONTENTS: (i) Seven full elementary (UK Primary) French (Ages: 6-12) color illustrated interactive power point shows packed with French native speaker sound files, songs, raps, and whole class interactive games; (ii) A3 and A4 class display/flashcard/poster materials; (iii) an illustrated color vocabulary learning mat; (iv) succinct slide by slide guidance lesson plans with activity suggestions as well as a full French to English plain speak vocabulary with relevant supporting grammar notes; (v) a differentiated three task black and white illustrated pupil workbook. Check out our detailed preview of the materials above. (US and UK spelling versions available in resources as appropriate). 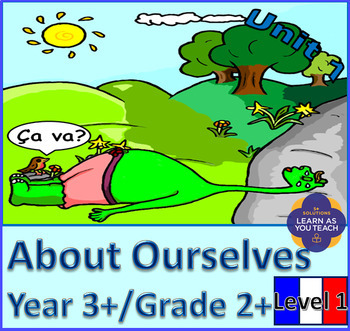 ​Learnasyouteach ​is a unique teaching and learning scheme which empowers elementary Grade 2+ (UK KS2) classroom teachers, parents, teaching assistants and home schoolers/educators to both learn French alongside their children in the 6-12 age range, (UK years 3-6) and (US grades 2-5) whilst delivering outstanding world language French curriculum. It is also really useful for French specialist teachers too! Enjoy! 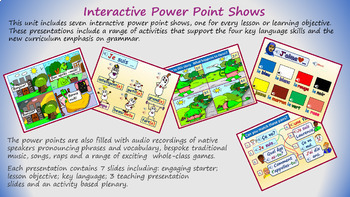 7 ppt shows + audio; 7 sheet copiable workbook; posters/flashcards; color pupil vocab mat; plans.